Bill Dilworth credits his grandfather for helping him catch his first fish, a brookie from a small Idaho creek. That started a lifelong love of fishing and the outdoors. At the age of 31, Bill went back to school. He started carving that same year. Studying the then-new Forest Practices Act, he turned his fascination for fish into a wood-carving obsession with the trout and salmon focused on the Pacific Northwest. A few years later, on a high-lead logging operation in the Coast Range, he was injured. While in recovery, he found more time for carving. Today, after nearly 40 years of working with woods, his favorite medium is sugar pine, from which he crafts carvings of rainbows, brooks, cutthroats and brown trout. His pieces of art are often mounted on beaver fall. One of his specialties is a mobile upon which five- to six-inch representations of all the trout of Oregon turn on monofilament and snap swivels suspended from lacquered pine boughs. He counts the Fall River, Crooked River and the Deschutes as his home waters, but he has a special love for the Metolius. It is not uncommon to find him sipping a cup of coffee in the Camp Sherman Store after a morning on the river. Bill Dilworth and Diane, his wife of 33 years, make their home in Central Oregon. 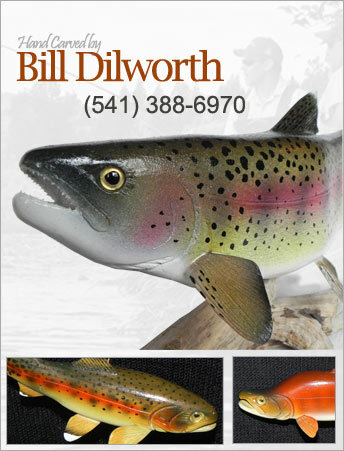 To contact Bill Dilworth, email to billdilworth@hotmail.com or call 541-388-6970.